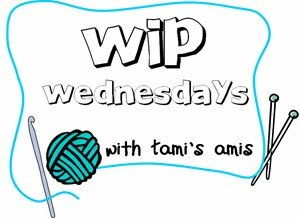 WIP Wednesday: Eyelets, Variegated Yarn and Cable - Oh My! Despite the lovely weather we have been having recently, my joint pain has been wreaking havoc for me. So, on Monday I decided enough was enough and started knitting myself some Fingerless Wrist Warmers, as my wrists are the ones that are the worst at the moment. The pattern is from the book Knitty Gritty: Knitting For The Absolute Beginner , and requires any double knit yarn. It just so happens that a few weeks ago I was walking around my local yarn shop and came across some lovely purple variegated yarn in the clearance basket. I quickly snatched it into my arms before the two old ladies behind me could guess what I was doing (after this, they were looking at me very suspiciously the whole time I was in the shop...) and charged my way to the checkout. I decided to start this project while sitting out in the sun watching my neighbours guinea pigs run around the garden. Before I knew it, it was 5:30pm and it was time for tea, and I had done 7 of the 9 required pattern repeats. This morning, I quickly finished the last two repeats and my doesn't it look nice! As you can see the pattern requires stocking stitch, a stitch which I normally don't enjoy. But I have quite enjoyed it on this pattern, possibly because of the clever eyelets! To make them, you simply put the yarn forward as if you were going to purl, but instead knit two together. This keeps the same amount of stitches while creating this beautiful eyelet pattern! I learnt to cable! I am very pleased, as it opens up a lot of (knitting) doors for me! As I wasn't very well on Saturday, my Mum popped into the Yarn Shop for me and bought two balls of Wisteria Double Knit Special (Because I am xD) by Stylecraft and two cable needles for sizes 2mm-5mm needles. On Sunday I started the pattern and so far I have knitted 30cm of the 60 that the bag requires (that is without the two 25cm handles I have to knit as well!). The pattern actually calls of Aran Yarn, but I forgot to tell my Mum, so I won't be able to store books in this bag as it won't be able to take it. Instead I will use it for storing my current WIPs! Well done on the cables, and that dress is lovely. The cables look amazing. I'm sure your wrist warmers will be amazing. ooo lovely dress!! And lovely colour purple! Hope the wrist warmers work/help!! Congrats on learning the cable, it will look awesome with your dress. Hope you're feeling better. YAY for cable knitting! I have yet to do it myself, so I totally understand not having all the beautiful patterns available. It must feel like a breath of fresh air. 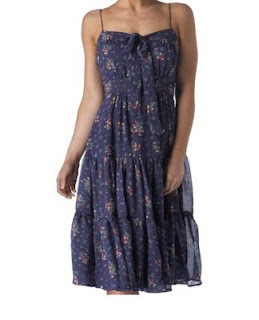 Oh, and I'm not a dress person normally but LOVE LOVE LOVE this!